I recently had a very personal lesson in forgiveness. I had done wrong to someone and hurt them. After a short time, I apologized and they quickly forgave me. It seemed simple enough except that the guilt that clung to my heart was agonizing. Thinking about what I did would immediately bring me to tears. I spent the week feeling terrible. I read my Bible, I prayed but it seemed like I could not let go of the pain and lay it at Jesus' feet. I think I knew that if I would just release it, then my heart would feel free again. It was such an incredible burden to cling on to and was as if I were chained down. After sharing this experience with someone, they texted me this verse from 1 Peter 4:8 "Above all, love each other deeply, because love covers over a multitude of sins." There is no doubt in my mind that I love this person and I alway will. Could I let myself believe that once they forgave me, love would blanket my sin? Psalm 55:22 also reminded me, "Give your worries to the Lord, and he will take care of you." 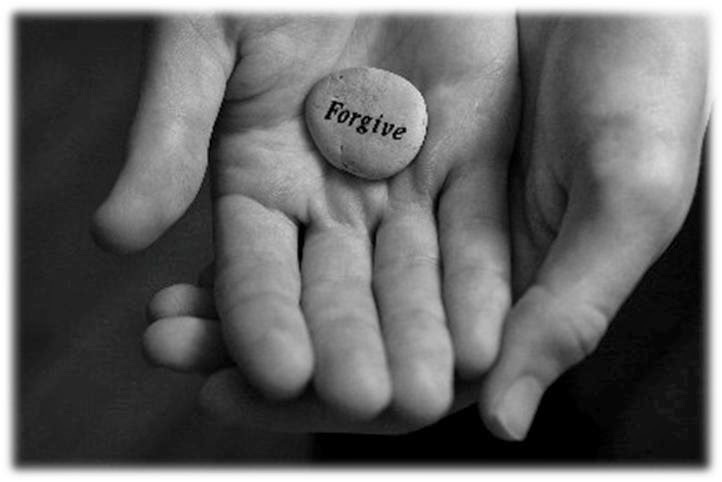 Colossions 3:13 says "Forgive, as the Lord forgave you." This means we need to forgive ourselves and often that is just as hard as forgiving someone. During this struggle I read online, "Failing to forgive yourself will put blinders on your spiritual eyesight quickly. It will cause you to see things through the eyes of guilt, shame and condemnation. It will ruin your faith, and cause you to go blind spiritually." (cited from HERE) That got me to the core. I have been wanting a grander relationship with Jesus and I had recently made huge strides in my walk with Him and here I was holding on to this guilt that was blinding me spiritually. I knew something had to change. This event consumed my thoughts for four whole days. It was eating me up. Although, I don't recall the turning point, I can remember physically opening my hands and letting the pain of guilt be taken away. It was almost immediately that I felt a lifting of a weight off my chest and shoulders. This negative feeling had taken such a hold on me and I finally felt relieved and free. What a joy to be released from the chains of guilt and I am so thankful that my God is patient and loving and has taught me to forgive. Thanks for this. I think forgiveness in the true sense if the word is just as hard as repentance. That whole giving up of our pride to admit we wronged someone and being ableto talk about it is a true act if the Spirit in us/you.